The Database Enhancement Gateway, which allows repairers and insurers to make inquiries and suggestions of the Big 3 estimating providers at no cost, was augmented in 2015 to offer weekly tips for repairers on the Audatex, Mitchell and CCC programs online and through the Society of Collision Repair Specialists’ email list. The DEG in April and May drew repairers and insurers’ attention to some masking procedures which aren’t included in Mitchell and CCC labor times, respectively. “As always, Material cost are NOT INCLUDED in labor times,” the DEG stressed. It offered this guidance about CCC labor times as well. A variety of CCC entries involve not-included masking, according to the DEG. The “Basic Color Coat Application” entry breaks down other masking that is and isn’t included, according to the DEG. Included items include “Back tape opening (handle, lock cylinder, mirror),” “Mask adjacent panels (3 foot perimeter),” “Mask / close gap between adjacent panels up to foam tape (over spray),” “Mask glass opening,” “Mask / protect grille radiator opening (over spray),” “Mix paint (color with necessary solvents)” and “Remove masking,” according to CCC. Not-included items include “Cover mask engine / compartment to prevent overspray,” “Cover / mask entire exterior of vehicle to prevent overspray damage,” “Cover / mask for prime and block,” “Cover / mask for cut-in,” “Cover / mask recessed edges / jambs,” “Cover / mask trunk / compartment to prevent overspray” and “Cover / mask interior of vehicle to prevent overspray damage,” CCC states. The DEG also reported that the “Color Blend (Adjacent Panels)” and “Three-Stage Color Blend (Adjacent Panels)” CCC entries both declare “Masking of attached parts” not-included. Interestingly, CCC lists “Cover / mask recessed edges / jambs” as not-included in the “Color Blend” entry but included in the “Three-Stage” section. In the event a facility decides roping or “lifting” window seals are best repair option for the vehicle repairs, Published refinish times are for one color applied to new undamaged OEM replacement components, without exterior trim, interior trim or other attached components. Roping or lifting seals would require an on the spot evaluation for labor time if required. The DEG in May called repairers’ attention to how taking care of a vehicle about a quart low would be a not-included operation in certain cases. “An example would be vehicle with oil, transmission coolers built into the radiator or separate cooler requiring to be disconnected, drained and refilled using the appropriate fluid,” the DEG wrote. 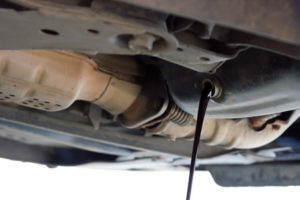 “An example would be having to bleed or purge air out of a cooling/ radiator during the refill process, or filling and bleeding a brake system after opening the fluid lines to disconnect,” the DEG wrote. 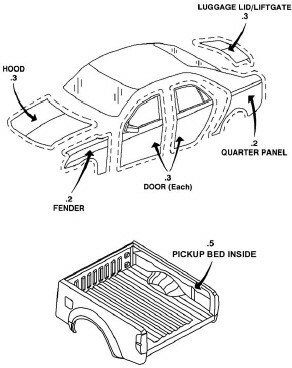 The word “Complete” in the Mitchell operation “Refinish Complete Bed Assy Including Tailgate” can be misleading, for it doesn’t include the underside, according to the DEG. Any time you spend accessing OEM repair procedures — as well as the cost to subscribe to each OEM site — isn’t included in any of the three estimating services’ labor times, the DEG explained in May. “OEM information website access cost is NOT INCLUDED in developed labor times in all three estimating systems,” the DEG wrote. “OEM technical information sites offer multiple subscription options available to end users depending on their specific needs and time. Research and disgnostic labor time is also not included in published labor times. You get a single “standard tint” operation included within Audatex’s two-stage refinish setup, according to a P-Pages entry shared by the DEG in June. Sometimes, that won’t be enough time, Audatex agrees. “Audatex’s studies revealed instances where additional time was required for the tinting process,” Audatex wrote in its Database Reference Manual. “The range of this additional time was commonly between 0.1 and 1.0 hours with an average of 0.5 hours per estimate per color.